can see from the accompanyi ng shots, I managed a few distant shots, including one in a dive, just about to hit the water. 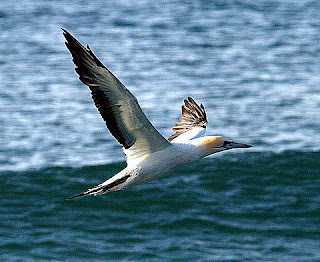 I watched the gannets closely as they fished around the bay, noting their fishing methods, particularly how they use their tail as a dive brake by depressing it, causing them to stall and slowing them down. A quick hover, followed by their spectacular dive and plunge--magnificent! I've watched as large flocks of them repeatedly plunge dive, sometimes from only a few metres above the surface, presumably when their prey is near th e surface, or in shallow water. 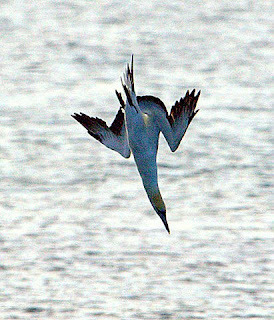 Neither of the 2 gannets in the bay came really close, as I'd hoped, but they were certainly still worth watching. Back down the inlet, some of the pelicans and cormorants, now joined by Crested Terns and the odd Kelp and Pacific Gull, were fishing close to the boat ramp, so I made another quick drive to close on them. Most of the Great Cormorants were now drying out on the sandbanks, probably having had their fill of fish, leaving only an odd bird or two fishing, along with tens of Crested Terns and a few pelicans. It's always a somewhat frantic scene, as some of the hapless fish, in this case mainly Garfish, come up to the surface, giving the birds their chance of a feed. It's an all in melee, often only for a few minutes, before the fish are sighted elsewhere, causing another frantic chase. Whether caused by frustration or perhaps a reaction, I noted the confrontation photographed at lower left. A Gr eat Cormorant surfaced close to the pelican, garfish in bill. This immediately caused the pelican to set off in pursuit of it. 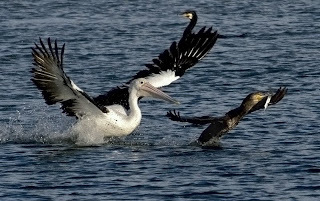 The pelican quickly overhauled the cormorant, landed on top of it, causing the cormorant to dive. 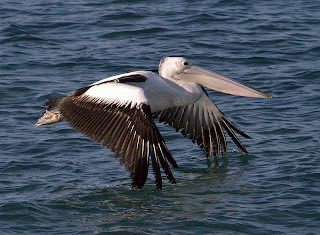 The pelican failed to acquire the fish, but it did leave me wondering why it had bothered. Perhaps the schools of fish were in too deep water for the pelican to successfully catch them, or perhaps this is a quite normal occurrence. I had only been at Little Swanport for about an hour or so, and by now the pelicans were fishing well down the inlet, in much shallower water, better suited to them, and the weather was closing in. Time to leave. A well worthwhile trip, my only regret was not arriving sooner. I stopped off briefly at Rostrevor Lagoon, near Triabunna, on my way back. The water level is very low--both Orford and Triabunna have water restrictions at the 'critical' level, and perhaps not surprisingly, the lagoon is a refuge for waterfowl, and there were some hundreds there. Of particular interest was the presence of 24 Blue-billed Duck and 17 Hardheads, both species uncommon in Tasmania, although Rostrevor Lagoon is one of the more reliable venues for seeing them.